The first “Pride” was a riot. There were no corporate sponsors and police were delivering blows, not handing out candy to families along a parade route. 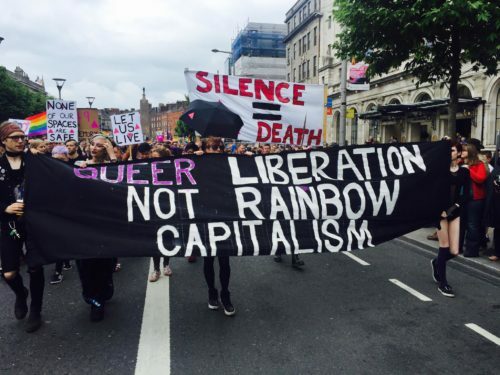 In those early years after Stonewall, Pride was about resistance. Today, the LGBTQ community has a lot to celebrate, and Pride celebrations reflect that. But as the corporate world gets increasingly hip to the fact that LGBTQ-inclusion is good for business, who and what our parades and festivals celebrate has shifted. Especially if the countries participating aren’t all that friendly to LGBTQ people in real life. But it’s not just organizations who get priced out. As one reader noted, it’s not just Pride that’s become a commodity. That’s why LGBTQ people need to smart about which companies they go to bed with. Some readers acknowledged the commercialism, but said LGBTQ people should embrace it. After all, there are perks. And some said that the corporate interest is a sign of our increasing equality. No matter how you feel about the increasing commercialization of Pride, it’s a reality. And one that can be used for good.